Welly-moot: We have tickets (but it was a difficult road)! It's been an interesting 24 hours. 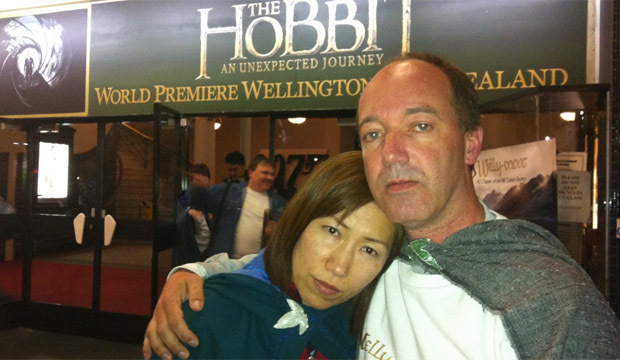 This time yesterday we were getting ready to go to the Embassy Theatre to wait in line for the Hobbit Premiere tickets for the 12:01am 12/12/12 session. It seems Fate had different ideas. 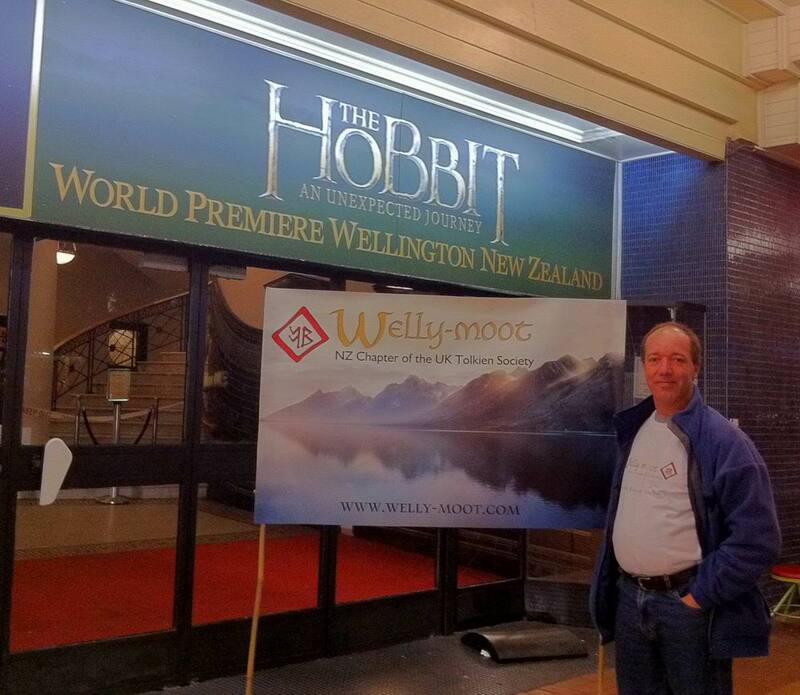 We were pretty stoked - the brand new Welly-moot banner had been delivered early that day, and also the Welly-moot T-shirts had come in, and so we handed them out to those members who had made it to the Line-party. It was also nice to meet up with some other familiar faces - Barry from Stansborough Clothing was there, and a few people I have hosted on a LOTR tour - Erin & Erica for instance. We had originally agreed to meet at 11:30pm, but apparently the first people were already queueing by 5:30pm or so. Alex and I came in about 9:00 or so, and by 11:00 most people had arrived. There were a lot of very excited people there. I guess all up there would have been around 50-60 people or so. One estimate had it at 200 but I actually took a rough count at one stage, just before midnight. Still a good turnout, I though - especially considering that the Embassy staff had only just announced one day before that the line-party was "on". 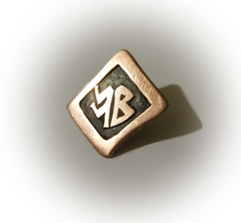 We had less than 48 hours to announce and prepare. Quite a number of people were wearing cloaks of various descriptions, and a few people were in full Middle-earth costumes. Around 11:30pm, the atmosphere was buzzing. That all started to change, around 11:45pm. Two guys behind us in line had been online and on the Embassy's website, hitting the "refresh" button to see if tickets were on sale yet. 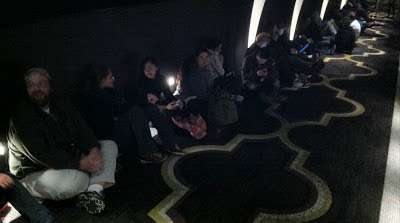 About 11:45pm, one of them noticed that tickets were available to some of the sessions. Odd, we thought - tickets weren't supposed to be on sale until midnight. But, you know, the main Auditorium seats 800 people, so plenty of time. By 11:52pm, the call went up from the laptop guys that the tickets had sold out. We still weren't called up to the ticket lines though. Around 11:58pm ((gotta love Facebook and the digital age - all this stuff is so accurate now)), we went to the line. Alex and I were the 4th group in line, and we were asked "which session would you like?". Um, the first one? Obviously? Isn't that why we came? No, they weren't available anymore. That's roughly where the party ended. We ended up having to settle for midnight tickets but in the (much) smaller auditorium, which does not have 48fps or the new Atmos sound system currently being installed in the building's main screening room. The prices were the same though. I bought six tickets, also some for a few absent Welly-moot members. The people behind us were told that session had also been sold out now. Some people bought tickets for other sessions, at later times or even dates. In other words, we weren't going to see it together as a group, or as the first country in the world. There was a newspaper reporter there, interviewing a few people about how they felt, and what we thought may have gone wrong. I answered a few questions fairly bluntly, I think. On the way out we were photographed on his iPhone camera since the DomPost didn't think it would be a big event so hadn't sent a photographer along. Still, at least they showed up, unlike TVNZ or TV3, who I'd also called ahead of time. I thought the picture captured our mood pretty perfectly. I've been on the phone most of the day today. I've lost track of the number of radio interviews I gave today. Radio NZ, RadioLive, Newstalk ZB. Other reporters as well. The Dominion Post suddenly decided they did need a better photo after all. One of the first messages this morning though, was a text message from Sir Peter Jackson's spokesperson, Matt Draviztki, to get in contact with him as soon as possible. 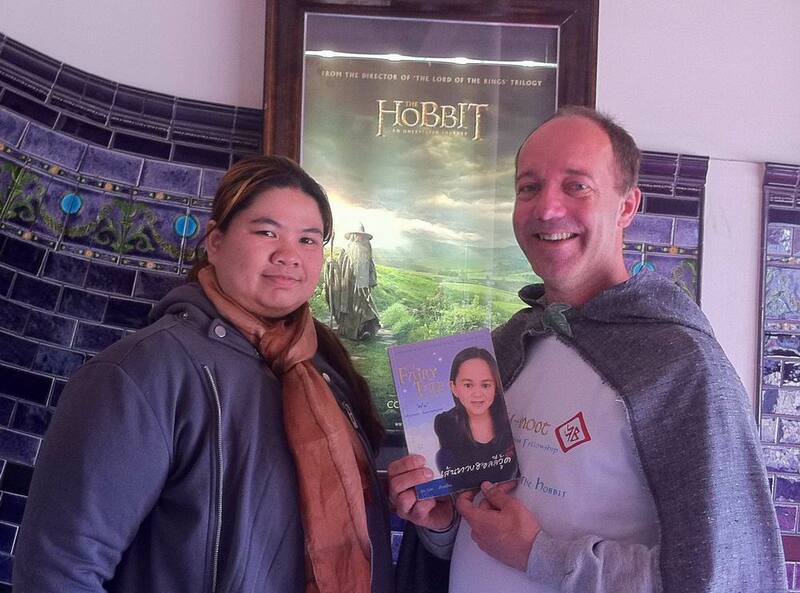 Apparently Sir Peter Jackson had heard about the fiasco, and wanted to get involved. Matt extended an astounding offer to the group - if I could get the whole queue back together, Sir Peter would ensure that we would see the movie in its full 48fps glory, come hell or highwater. I spent the better part of the morning trying to get in contact with 60 people who's names I did not take down last night. Luckily everyone seemed to be on Facebook, and there were a lot of photos taken. NB - if you were there last night, and I haven't yet contacted you - please drop me an email on "jack@pobox.com", giving me your name, your email, and your approximate place in the queue, and a photo of yourself there if possible. I also got a call from Sarah Meikle, who works for our city council-sponsored organisation, Positively Wellington Tourism (PWT). She told me what had happened. Apparently, about eight weeks ago the PWT had booked the entire first "public" session. They had asked for permission to do so, and had received it (so, the fault of this is NOT with PWT, or the Wellington Council). The reason they booked the session was so they could arrange for a huge party, and they intended to give away tickets via competitions etc. 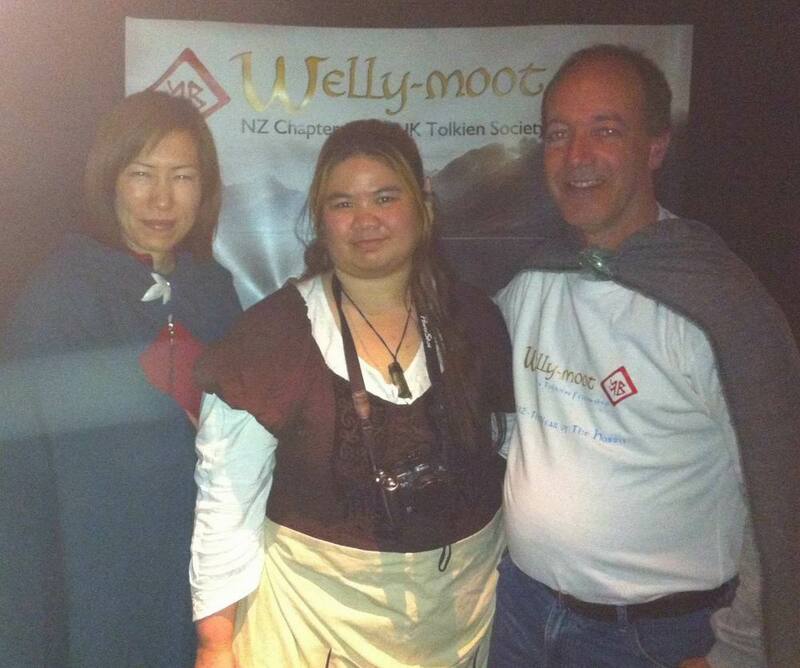 And so, it was decided to donate 120 seats to the Hobbit Line Queuers, and to the Welly-mooters. So a MASSIVE "Thank You" goes out to Sir Peter and Matt Dravitzki for their initial offer of assistance, and to the PWT's Sarah Meikle for clearing up a mess that they did NOT create, and had no real reason to clean up. Who's fault was it then? The Embassy Theatre? Not entirely, no. Certainly not the staff in the Wellington building. I've visited them this afternoon to disperse any "bad blood" and find out what went wrong. From what I can figure out, the staff in Wellington were expressly forbidden to talk about Hobbit screening times and sessions. They all knew, apparently, but were prevented by the Embassy's owners (Event Cinemas Ltd) from telling us about it. It's pretty messed up. It must have been pretty depressing for them to watch us for hours, knowing the party wouldn't last. Perhaps that's why they didn't approach us doing our stay? Nobody wants an angry horde of Hobbits on their back. Elly, the manager from the Embassy and myself have sat down and talked briefly this afternoon. She knew nothing about this debacle until this morning, when all hell broke loose. I think she was telling the truth - certainly she looked pretty distressed while talking to me, and apologised for the whole situation many times. So of the management of Event Cinemas I would ask this - please remember who pays your wages. It's the people who buy the tickets. And The Hobbit will be the three biggest movies in the next three years. Just sayin'. All we're asking for is some respect. From here we move forward again. I'm waiting for the final arrangements from the PWT to come through, and I still need a number of names, and email address. So if you were there last night, again, please do tell me where you were sitting - I have a pretty good idea of how many people were there. Send me emails to "jack@pobox.com", with photos if possible. Once my team of experts is ready, we'll try to hand out the tickets as fairly as possible. This does mean we won't be able to cater for large numbers of extra tickets though, so expect one or two tickets per person, and I reserve the right to the final say over it. If you know other people who were there, get them to mail me also if they haven't already. One more thing - if you've already bought tickets, and don't need them anymore because of this - the Embassy has said they will happily refund tickets bought last night. More information about the event will be posted here as it comes to hand. Stay tuned! Well I'm glad it all worked out in the end, but that's pretty poor from Event Cinema management. Oh Jack, I'm so glad for you! I thought about it today a few times while at work, and having to watch The Hobbit for the first time in the small screen without 48fps would have been terrible!! !